Technical Car Experts Answers everything you need: How to replace Heater/evaporator Core on chev 1/2 ton pick up? Remove the instrument panel glove compartment. Tag and unplug all electrical leads as necessary. Remove the center air distribution duct from the floor. 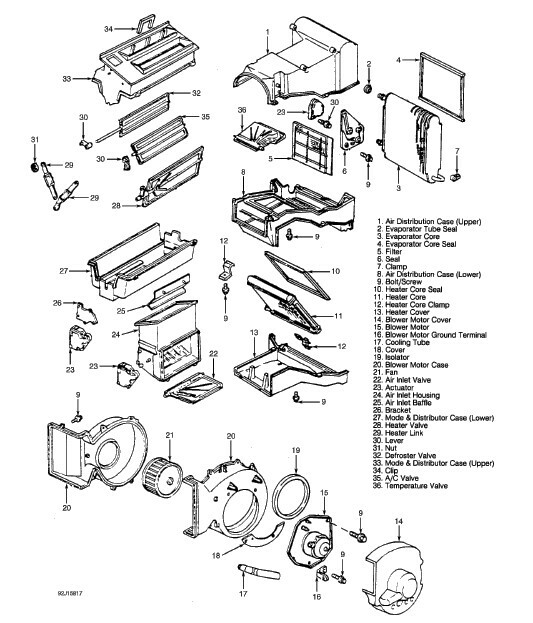 If necessary, remove the ECM and mounting tray. Remove the hinge pillar trim panels. Remove the blower motor cover and then remove the motor. Remove the steering wheel and tilt back the instrument panel slightly. Remove the coolant overflow tank. Disengage the heater hoses at the core connections. Unfasten the attaching screws and nut and then remove the heater case. Remove the seven screws and lift off the heater case cover. Remove the fasteners and brackets that hold the heater core to the case and lift the core from the case. Install the heater core in the case. Install the heater case bottom plate. Make sure there is a good seal. Install the heater case into the truck. Tighten the 4 lower screws to 17 inch lbs. (2 Nm); the upper screw to 97 inch lbs. (11 Nm); and the nuts to 25 inch lbs. (2.8 Nm). Connect the heater hoses at the core tubes. Install the coolant overflow tank. Install the instrument panel and the steering wheel. Install the blower motor and cover. Install the trim panels and if removed, the ECM. Install the air distribution duct and reconnect all electrical leads. Install the glove compartment. Fill the cooling system and connect the battery cable. Disconnect the negative battery cable and drain the engine coolant. Remove the right rear quarter panel trim and then remove the panel itself. Remove the right rear wheelhousing liner. 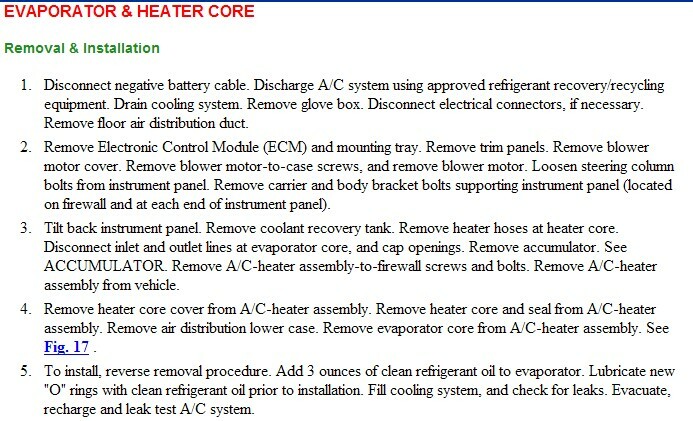 Disconnect the heater hoses from the core. Unplug the electrical lead. Remove the drain valve. If necessary, remove the blower motor. Remove the heater case cover. Remove the heater case cover and then remove the heater core. Install the heater core and then install the heater case cover. If removed, install the blower motor. Attach the electrical lead. Install the drain valve. Connect the heater hoses to the core. Install the right rear wheelhousing liner. Install the right rear quarter panel and then install the trim. Connect the negative battery cable and fill the engine with coolant. Center floor air distribution duct. ECM and mounting tray (diesel engines only). Tilt back instrument panel assembly. May be necessary to have an assistant when removing module assembly. Evaporator case bottom cover plate (63). Remove the seven screws that hold the cover plate to the module assembly. Heater core and seal from module assembly. Remove the four screws that hold the case cover to the module assembly. Install the four screws that hold the case cover to the module assembly. Heater core and seal into module assembly. Install the seven screws that hold the cover plate to the module assembly. May be necessary to have an assistant when installing module assembly. Screw (56) to 11 Nm (97 lb in) . Nut (50) to 2.8 Nm (25 lb in) . Screws (52 and 64) to 1.9 Nm (17 lb in) . Remove the instrument panel bezel. Remove the control panel-to-dash screws or release the snap-fit retainers using a small prytool. Lower the control panel from the dash, without kinking the cable, and disconnect the cable, vacuum harness (if equipped) and electrical harness. Connect the control cable, vacuum harness (if equipped) and electrical harness to the rear of the control assembly and position it into the dash. If equipped, install the screws and tighten them to 17 inch lbs. (2 Nm). If equipped with the snap-fit retainers, slide the assembly into the dash until the retainers engage. Install the instrument panel bezel and connect the battery cable. Pull the control panel out slightly, disconnect the electrical lead and then remove the control head. Connect the lead and slide the panel back into the console. Install the roof console and connect the battery cable. Remove the control panel bezel. Pull the control panel out slightly, disconnect the electrical lead and then remove the control panel. Install the bezel and connect the battery cable. Labels: How to replace Heater/evaporator Core on chev 1/2 ton pick up.